Biblia Global embarks upon important missions in its effort to bring the Gospel for Asia’s remote lands and people. Due to the risks involved, specific details must remain private, but the net result sought by Biblia Global with their Bibles for Asia program is to bring 50,000 Hmong Bibles to one region with more than 60,000 Hmong Christians; the entirety of the Hmong people population remains spread across mountainous areas spanning across Thailand, Myanmar, Laos, China, and Vietnam. Biblia Global is reaching out to its American Christian friends and colleagues in a heartfelt request to deliver 60,000 Bibles to the Hmong people in Asia in 2016. In just one province, more than 60,000 Hmong Christians have been counted, yet only 10,000 Hmong Bibles are in circulation, meaning that only 1 out of every 6 Christians has been armed with the Word of God. These people show a strong dedication to God’s Word, despite the persecution and pressure they receive from both governmental agencies as well as being victims of discrimination in many countries due to their minority status. The missionaries involved in this important outreach program are taking extreme personal risks in order to ensure that the Hmong people are being reached and given God’s message of Salvation and Eternal Life. Due to the high peril involved, discretion must be maintained. 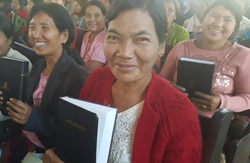 By building a reliable yet anonymous network of believers who can contact the Hmong people, special Bibles translated into the Hmong language are now being delivered throughout much the region. The caring and dedicated brothers and sisters working with Biblia Global continue to seek the help and support of the many Christian across America who understand the importance and immediate need of bringing the Gospel for Asian people such as the Hmong. More information concerning this valuable outreach program and how Christians are getting involved may be found at the Biblia Global website.